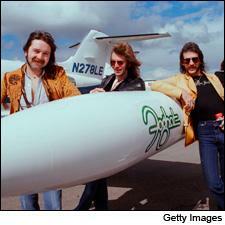 Foghat drummer Roger Earl (center) is making Santa Maria Valley Pinot Noir, Chardonnay and more. • It was a slow ride for Foghat Cellars to come to Unfiltered's attention, but perhaps a testament that the British classic rock drummer Roger Earl and his wife, Linda, are in it for the wine, not the publicity. In other words, they're taking it easy. We found out about Foghat Cellars when their wines showed up as submissions for blind review at the Napa office a few weeks ago, not through the usual flashy press releases that accompany rock-star wines. Foghat Cellars is a collaboration between the Earls and former Talley Vineyards winemaker Steve Rasmussen, who was inspired after seeing Foghat perform at the California Mid-State Fair in Paso Robles in 2007. Foghat Cellars' first vintage, bottled in 2008, was just 90 cases of Cabernet Sauvignon. Since then, they have branched out to Sierra Madre Chardonnay, Santa Ynez Valley Cabernet, and Chardonnay and Pinot Noir from Santa Maria Valley, all priced at around $20 to $25 per bottle. Rasmussen also runs a mobile wine-bottling business called Slo Bottling. The Earls and Rasmussen don't take it easy or slow at Westgate Cellars in Santa Maria, however—when the grapes come in, the three of them can be spotted doing plenty of heavy lifting themselves, from punch downs to shoveling grape must. • Mark your calendars: This is officially the week that wine-and-food celebrity culture jumped the shark … right into our childhood hearts. Sure, this upcoming weekend's second iteration of the Great GoogaMooga festival in Brooklyn, N.Y.'s Prospect Park will feature plenty more wine, beer, food and music, but Unfiltered has become oddly obsessed with the premiere release of the Great GoogaMooga trading cards, a series of retro-styled cards complete with stat- and recipe-filled backs that will be distributed at the festival in five themed wax packs (each featuring seven cards, one sticker and … no gum?! ): The Going Ham series features pork-loving chefs, including Top Chef star Dale Halde; Sausage Party includes the "Haute Heavyweight" Daniel Boulud and the Spotted Pig's April Bloomfield; Drinking Buddies spotlights friendly local brewers and wine pros like Corkbuzz's Laura Maniec and Red Hook Winery's Mark Snyder. There's even a set of cards devoted to chefs' moms. Awwww. And of course, in addition to free trading cards, there will be seminars from Boulud, Michelle Bernstein, Christopher Kostow and other chefs, more than 100 wines available to festivalgoers, and performances by The Flaming Lips, De La Soul, The Yeah Yeah Yeahs, Kool & the Gang and many, many others. We'll have the wrap-up next week, including how many bottles of wine a Boulud rookie card is going for. • Festivalgoers were squeezed in tighter than a third press of Cabernet for BottleRock, the five-day rock’n'roll, wine and food extravaganza held this past weekend at the downtown Napa Fairgrounds. Big weekend crowds were thought to be in the 35,000 range on Friday and Saturday, taking in the festivities built around some 50 acts performing on multiple stages. Headliners like The Black Keys and Dwight Yoakum wowed fans. Sonoma vintner Les Claypool’s fingers were flying for Primus’ show. All in all, things went smoothly, or at least as smoothly as one could hope when a city the size of Napa is inundated by 100,000 partiers. The wine booths more than held their own against the beer purveyors, and what appeared to be hand-rolled cigarettes seemed quite popular …. BottleRock promoters said the event would return next year in May in an abbreviated version of three days instead of five. OperaWine featured the wines of 100 of Italy's best producers. • Wine Spectator once again had a big presence at this year's VinItaly international wine exhibition in Verona in April. The huge event kicked off with OperaWine, a grand tasting featuring 100 top Italian producers co-hosted by Wine Spectator and VinItaly at the Palazzo della Gran Guardia. In all, VinItaly 2013 welcomed nearly 150,000 visitors from more than 100 countries to the wine fair.